The next day the weather was amazing so we headed up the Lake Louise gondola. First grizzly I've ever seen in the wild. Seeing it from the gondola was just about the perfect way to take photos and not get eaten. We took a short hike to Peyto Lake with 2 unwilling crying kids in carriers and 5,000 mosquitos. Sunset on Mt. Temple and Little Temple as seen from the hotel. The next day we braved the parking madness (the parking is really limited) to check out Moraine Lake. Short hike up to get this view. Would have loved to take a canoe out but the line for rental was multiple hours long. From Calgary we drove into the mountains and stayed at Lake Louise. Amazing freeway infrastructure, completely fenced with these huge wildlife-only overpasses. 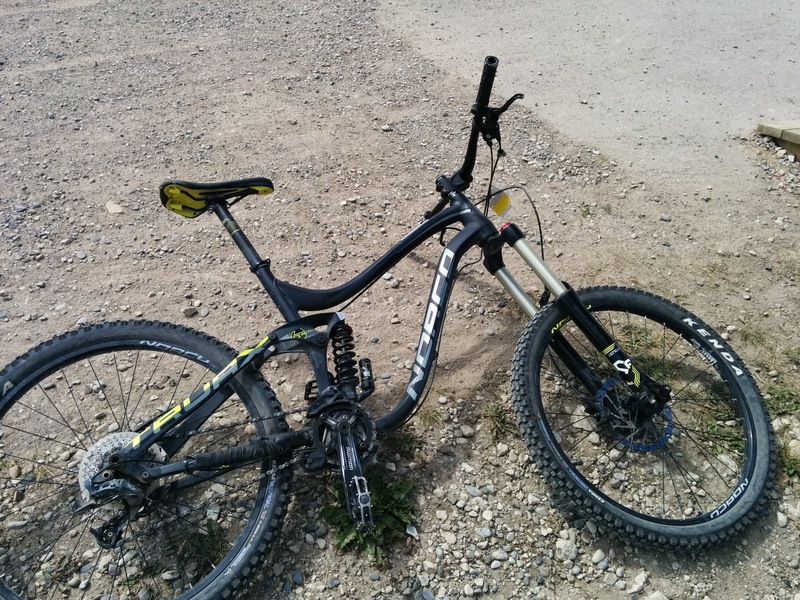 We hired bikes from Wilson Mountain Sports, which is really close to the Tramline trail. This is me pulling two kids and all of our gear up the Tramline trail to Lake Louise. Great trail, we were the only ones on it. Had to sing the whole time to avoid surprising bears. Much nicer way to get to Lake Louise than driving and fighting the crowds for a park. 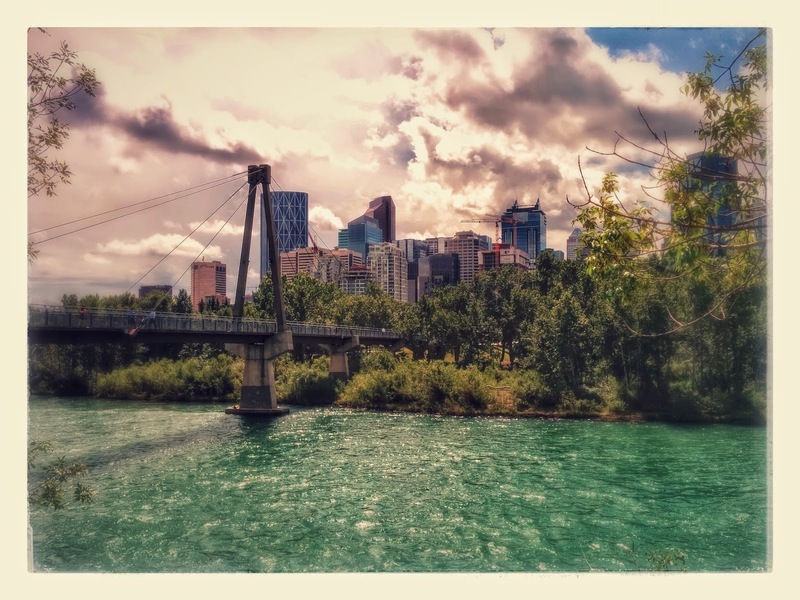 We came back down the Tramline, then took the Bow River loop. It wasn't really suitable for the bike trailer. I felt bad for dragging the kids over lots of tree roots and a very bump path. The next day the weather in Lake Louise was terrible so we drove over to Banff and went for a cruise on Lake Minnewanka. It was nice enough, but not super interesting. The next day we drove back to Banff to see Johnston Canyon in Banff National Park. Just enough time left in the day to see the Cave and Basin National Historic Site, the birthplace of Canada's National Parks. There's an interesting museum and a small cave with a sulfurous pool. 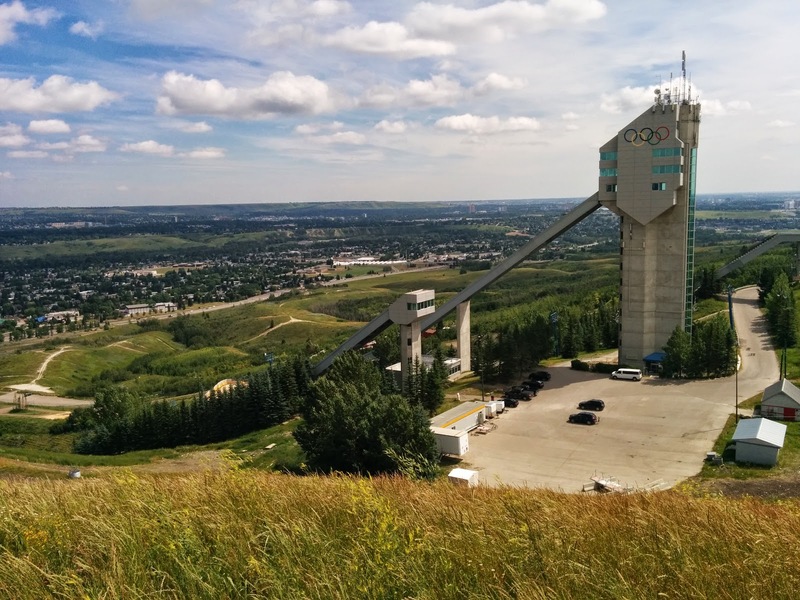 We spent a number of days in Calgary, Canada waiting on government bureaucracy. Here's how we filled in the time. 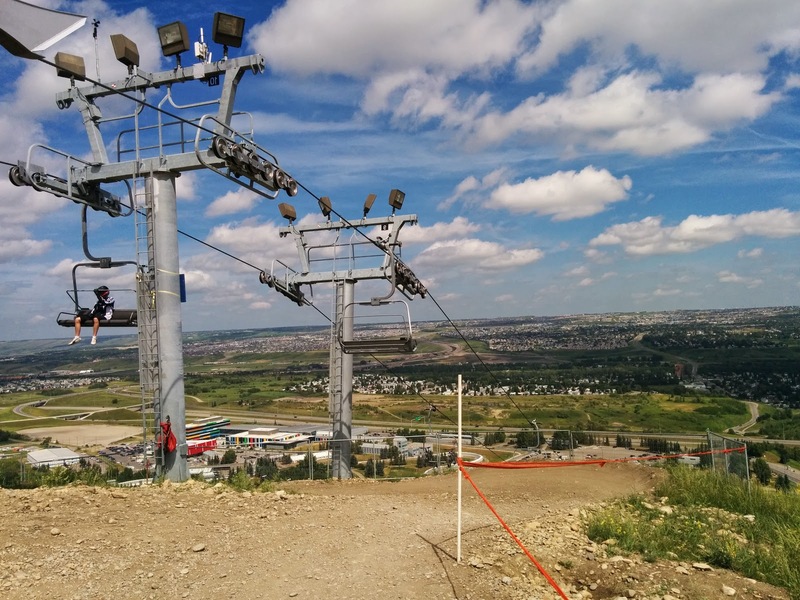 Em took the kids to the Zoo (which was great apparently), and I hired a bike and went mountain biking at Calgary Olympic Park. I had a great time riding the chairlift and barreling down the mountain for 4 hours. Only one stack, a somewhat impressive over-the-handlebars job for which I mostly blame the reversed American bike brakes (right is rear). The biggest hazard was coming around a corner and finding a whole lot of school camp kids parked on the trail, intimidated by the next section. Runs are graded like ski runs, I rode a mix of green and blue. We visited the Southland Leisure Center, which is an impressive sports complex (hockey rinks, gym etc. 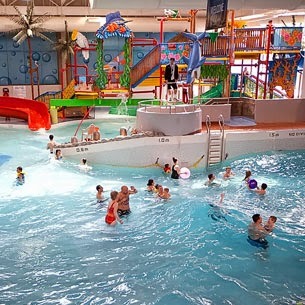 ), but we came for the awesome indoor pool. This is basically the only time I've taken the kids to the pool and had a great time myself. We switched out kid minding duties and took full advantage of two big waterslides, a wave pool, and a swinging rope to jump off. I wish we had a pool like this at home. Starting to get jealous of Calgary's parks and facilities we visited the Telus Spark Science Center, which is one of the better science centers I've ever visited. There was tons of stuff to occupy the 3yr old, including a great theatre demo about the science of sound featuring a Reubens' tube playing Gangnam Style. And there was even little kid play area that kept the 1yr old occupied for over an hour. 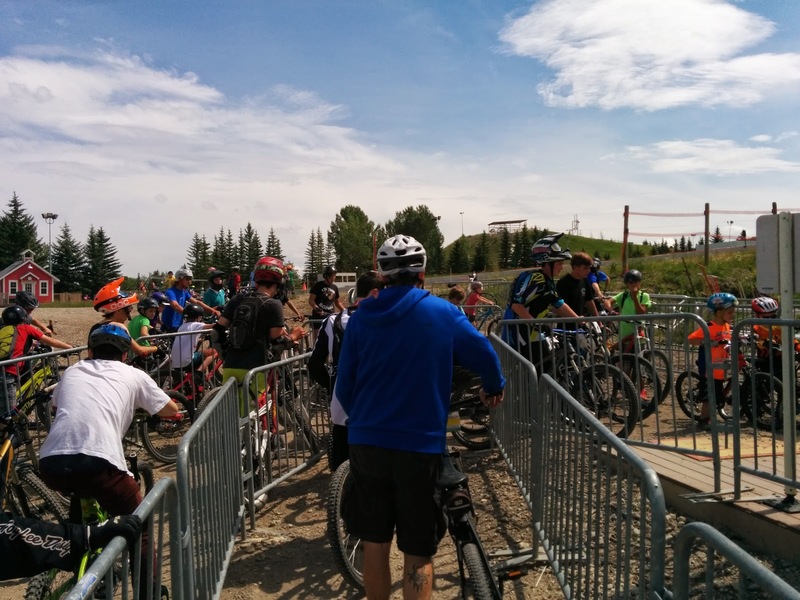 We tried to hire bikes to ride along Calgary's impressive (apparently the best in North America) bike path system, particularly along the river, but had to abort mostly due to a lack of places offering kid trailers for hire. 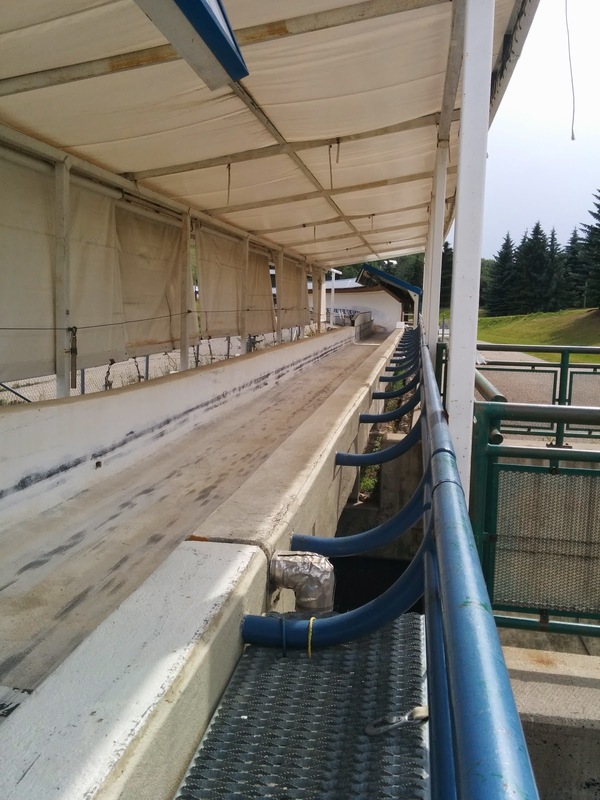 Instead we ended up checking out the University of Calgary sports facilities, including the Olympic speed skating track, and and amazing array of other sports facilities. 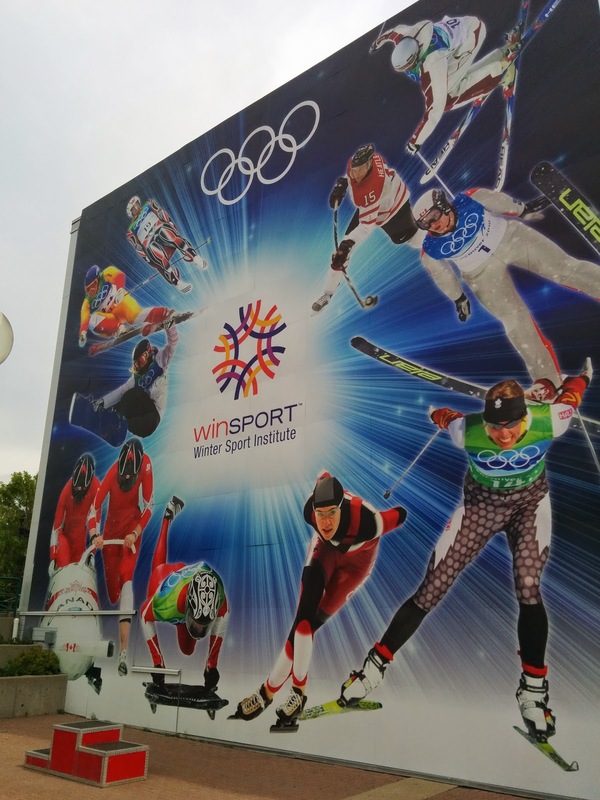 And faced with more time to kill we visited yet another jealousy-inducing indoor sports complex. 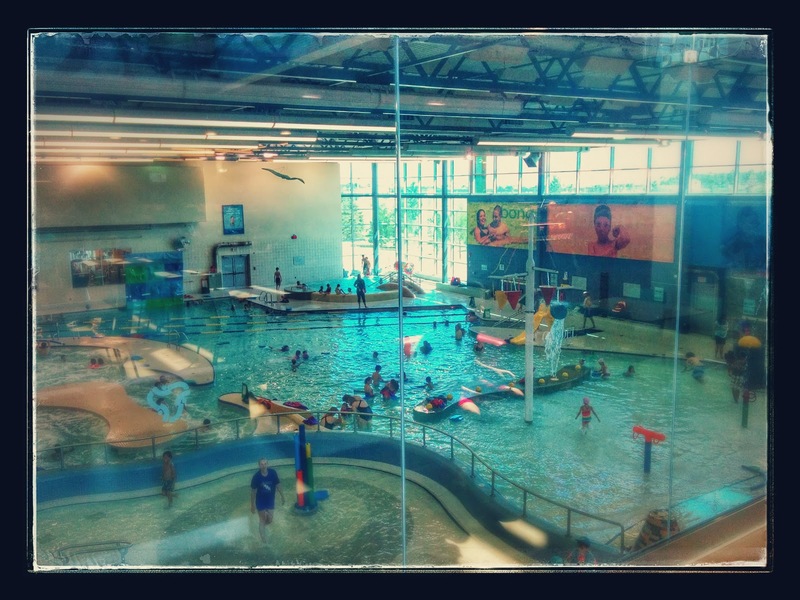 The population of Calgary is only ~1 million, but they have the best facilities I have seen anywhere. My Canadian friends tell me Alberta is flush with oil money, so perhaps that's why there's flat screen TVs in the city hall carpark showing the traffic map. Cardel Place swimming pool. It's run by a not-for-profit. The building also includes every other indoor sport facility you can imagine, and there is an attached public library. 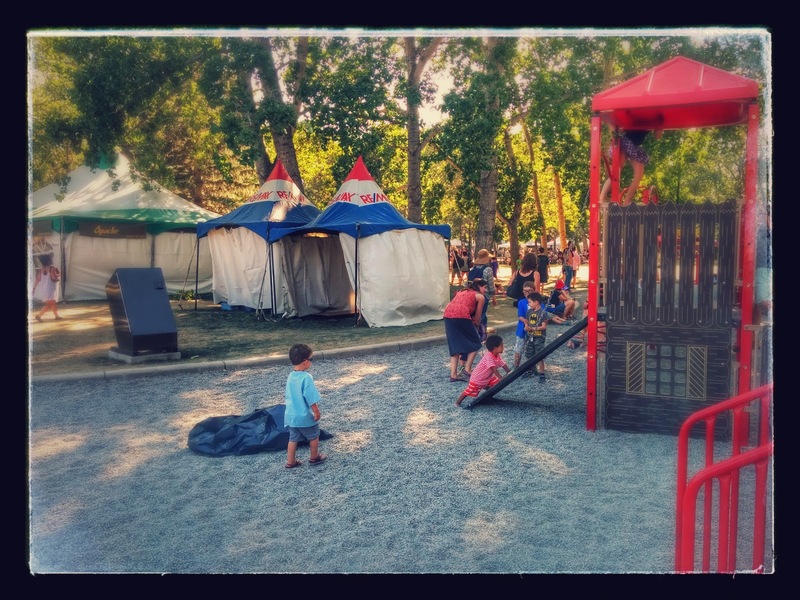 We also tried to go to the Park on Prince's Island, but there was a folk festival in progress, for $70 a head. Amazingly they escorted us into the playground in the middle of the festival for free :) I guess that's the deal they struck with the city to take over a public space. Not the worst place ever to be marooned for a few days. I just wish we hadn't made our last hotel the airport hotel...Fine for one night, not so good for three.